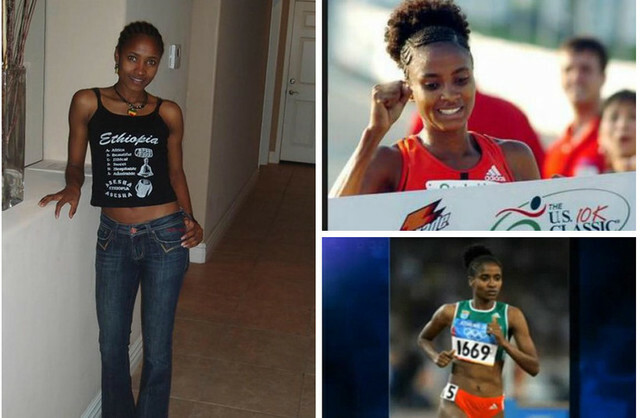 Washington D.C. (TADIAS) – Family members of 26-year-old athlete Meskerem Legesse who died on Monday after collapsing at a Chinese restaurants in Hamden, Connecticut said that they are preparing to repatriate the body of the former Olympian to her birth country Ethiopia. The heartbreaking incident took place while Meskeram was at the eatery with her her 2-year-old son. Family members told Tadias that arrangements are being made to fly her body to her hometown in Arba Minch early next week. Her children are now with their father whom Meskerem was planning to marry. “We are preparing to take her body to Ethiopia on Tuesday,” a relative said from Westport, Connecticut where Meskerem had resided. “Many people including several Ethiopian athletes are currently contributing money to take her body back to Ethiopia,” said the family member who asked not to be mentioned by name. Tadias learned that Meskerem suspended her athletic career after she collapsed during training in 2009 in Arizona. She was shortly diagnosed as having a heart problem. Meskerem was due to give birth in three weeks, and doctors were able to save her baby, her second in addition to her 2-year-old son. “Her baby is in a hospital and is improving everyday,” added the relative. The family member said her pregnancy was considered to be high risk due to her heart problem. The cause of death is still under investigation.